The DISLABELED Film Series is back! After a very long hiatus, we are back this month with a new screening and discussion. We will be joined via Skype by guest speaker, director Patty Berne. Sins Invalid: An Unshamed Claim to Beauty (32 Minutes): Witnesses a performance project that incubates and celebrates artists with disabilities, centralizing artists of color and queer and gender-variant artists. Since 2006, its performances have explored themes of sexuality, beauty, and the disabled body, impacting thousands through live performance. Sins Invalid is as an entryway into the absurdly taboo topic of sexuality and disability, manifesting a new paradigm of disability justice. Admission: Free. RSVP Recommended. Photo ID is required for entry into the building. 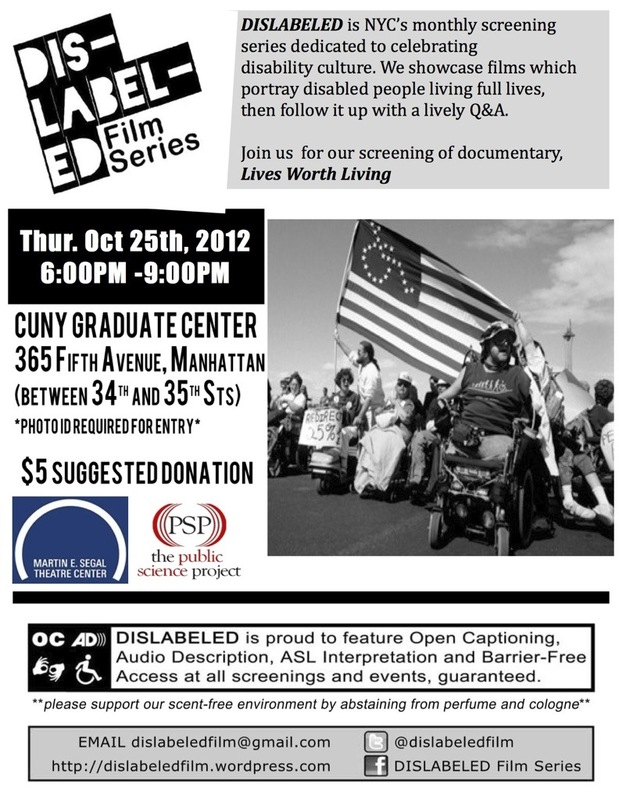 To RSVP send an email to dislabeledfilm@gmail.com. Please include any accommodation requests. Accessibility: The space is wheelchair accessible including bathrooms. This film has audio description and open captioning available. ASL interpretation is available. Please let us know if you need any accommodations when you RSVP. Accommodations must be requested at least 48 hours ahead of time. And don’t forget to RSVP! E-mail dislabeledfilm@gmail.com to save your seat. The DISLABELED Film Series is back! After a long winter break, we are back this month with a new screening and discussion. Photo ID required for entry. $5 suggested donation. Please let us know if you need any accommodations, when you RSVP. The DISLABELED Film Series is back! After a long summer hiatus, we are back this month with a new screening and discussion. ASL Interpreting and Audio Description will be provided. Please let us know if you need these or any other accommodations, when you RSVP. During the Holocaust, Dr. Josef Mengele conducted “scientific” experiments on a Hungarian Jewish family of actors and musicians, all people of short stature. Fifty years later, Hannelore Witkofski, a woman of short stature born in post-war Germany, befriends the only surviving family member, Perla Ovitz, now living in Israel. Perla asks Hannelore if she would look for a film that Mengele made of her family in Auschwitz. As we follow the search, Liebe Perla resurrects a lost history – the history of brutality toward and murder of disabled people in Nazi Germany. 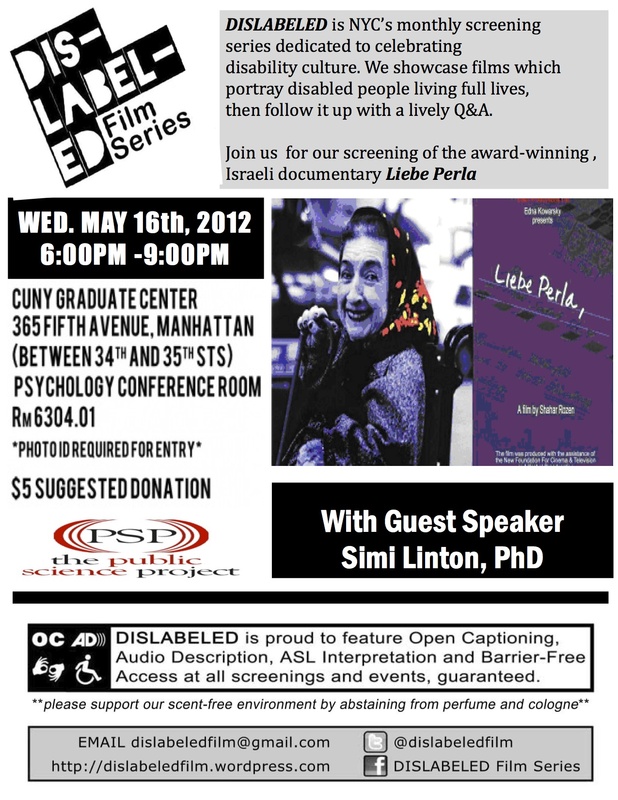 Liebe Perla has received several significant prizes at international film festivals, has been shown on leading European TV stations, including NDR Germany and ARTE France, and was featured in the “Reframing Disability” series at the 2000 Margaret Mead Film and Video Festival in New York. The DISLABELED Film Series is back! After an our spring break in April, we are back this month with a new screening and discussion. Watch the trailer for Yo, También! The March 7th debut of the DISLABELED Film Series is almost here! To help get yourself excited about tomorrow’s screening, check out the preview (above, or direct link) of our selected film YO, TAMBIÉN. And if you still want to RSVP, download flyers, make a donation, or just spread the word, all the information is just a click away! Here is an updated version of the flyer for our March 7th inaugural screening!